ES - Why high EMF at this particular outlet receptacle? Why high EMF at this particular outlet receptacle? Hi, please see attached image below. 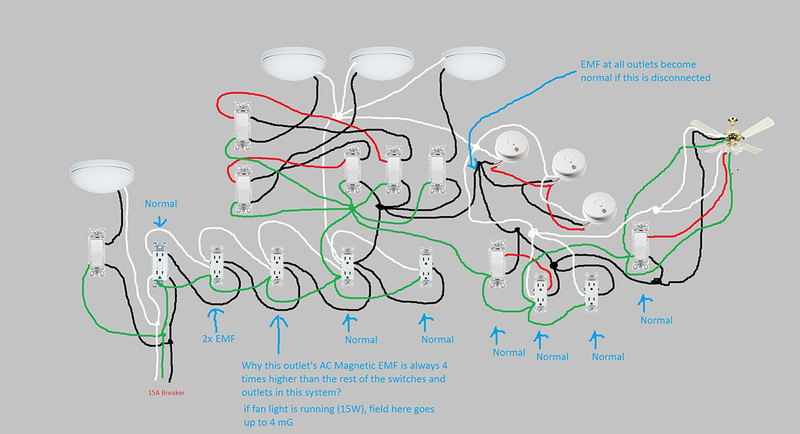 Do you know why the indicated outlet, out of everything in this mess of a circuit, has particularly high AC Magnetic EMF emanation? The wiring inside the outlet box looks normal and standard (2 neutrals on left, 2 hots on right, grounded correctly, no ground to neutral connection), I even replaced it with a different receptacle, same phenomenon. It's also not caused by external fields, because disconnecting the latter part of the circuit brings the field back down to normal. Thanks! Re: Why high EMF at this particular outlet receptacle? Thanks for your response. I wish I could redo the wiring, but that's impractical. I would have separated this circuit into at least 3 if I was designing it... there's only 3 feet separating the problem outlet and the one to its right, which then branches into two separate paths. (You would expect the branching outlet to be equal or higher in EMF, but no, it's much lower). There's really nothing special in between these two outlets... no load, no switches in between.